« Is Soy Good or Not Soy Good? Memorial Day weekend is the unofficial beginning of summer. One of the highlights of this weekend is the start of picnics and Bar-B-Qs, and one of my favorite foods for picnics is potato salad. Now, some of you may be thinking, “But aren’t potatoes high in calories and carbs?” Since I raised that same question when I was pondering what to post on my blog this week, I checked out potatoes on the Internet and came up with an interesting article from the Washington State Potato Commission at www.potatoes.com. Potatoes are an excellent source of potassium (40% more than the banana), which is important for muscle performance and the response of nerves. They also contain Vitamin C, Iron, and other important nutrients in small amounts. (The article on the Internet has a nutrition chart.) Besides the bevy of nutritional benefits that potatoes offer, they are also good sources of fiber and can be prepared in a variety of ways. According to the article, carbohydrates do not cause weight gain unless you consume more calories than you expend; also, carbs do not automatically cause a spike in blood sugar levels, and carbs are not responsible for causing diabetes, heart diseases or cancer. So the potato, eaten in moderation, can be part of a balanced diet. Traditional observance of Memorial Day has diminished over the years. Many Americans nowadays have forgotten the meaning and traditions of Memorial Day. At many cemeteries, the graves of the fallen are increasingly ignored, neglected. Most people no longer remember the proper flag etiquette for the day. Memorial Day parades, many have not held a parade in decades. Some people think the day is for honoring any and all dead, and not just those fallen in service to our country. I’ve never been a great mayonnaise fan, using it in very few dishes, such as last week’s Tempuna recipe. I prefer tossing my potato salad with oil and herbs. 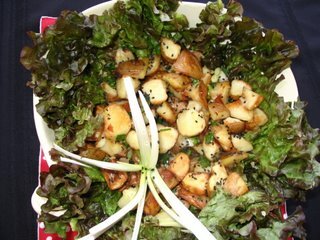 Below is my own recipe for Roasted Potato Salad, with crispy potatoes tossed with oil and herbs— a lighter salad than the one made with mayo. Also, the roasted potatoes never seem to get soggy. Instead, they are crunchy, like the potatoes often served with eggs for breakfast at a restaurant. 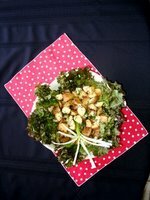 Hoping you will try my non-traditional potato salad as you celebrate a traditional American holiday. 1. Scrub and cut potatoes in half or quarters (if larger than a handball). 2. Place potatoes in steamer and steam for about 15 minutes, until barely tender. While potatoes are steaming, preheat oven to 450 degrees. 3. Remove potatoes and cool until you can handle. Cut into bite-sized pieces. Place on a non-stick cookie sheet and toss with 2 T. oil and sprinkle with a little salt & pepper, if using. 4. Bake in the middle of the oven until edges are crisp (20-30 minutes), turning once to be sure all sides are getting crisp, using the last 5 minutes to place on broil. Watch they don’t burn! Remove from oven. Toss with another 1-2 T. oil, herbs of choice, scallions, and seeds, if using. Serve warm or chilled, but if refrigerating overnight, you may need to add a little more oil the next day. VARIETY of CHOICES: Olive oil with oregano, thyme and basil; corn oil with hot pepper flakes and cilantro; peanut oil with cardamom; toasted sesame oil, soy sauce, and black sesame seeds (Photo). Enjoy! This entry was posted on Thursday, May 25th, 2006 at 5:41 am	and is filed under Kitchen Nutrition. You can follow any responses to this entry through the RSS 2.0 feed. You can leave a response, or trackback from your own site.